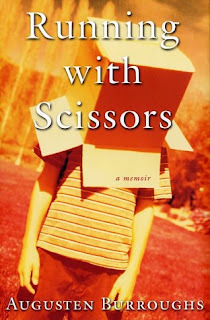 I've heard a lot of good things about Running With Scissors, the memoir of Augusten Burroughs' (pictured below), so I started reading it the other day. Nine-year-old Augusten is growing up in Amherst, Massachusetts and spending a lot of time with his mom, who "looks a lot like a young Lauren Bacall, especially in the eyes." She is also "a star, like that lady on TV, Maude, except my mother doesn't have all those chins under her chins." She gives poetry readings and submits these writings to The New Yorker. Augusten dreams of one day becoming a flight attendant: "I want to be the one who opens those cabinets above the seats, who gets to go into the small kitchen where everything fits together like a shiny silver puzzle ... I've already memorized almost everything these flight attendants say." He dresses in his mom's clothes upstairs in their house when his mom is out reading poetry and his father is downstairs watching TV and drinking. He refuses to go to school if his hair is out of place or if there is a piece of lint on his shirt. 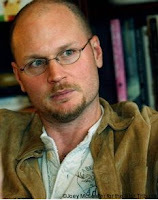 Augusten's father is "a highly functional alcoholic professor of mathematics at the University of Massachusetts" who had psoriasis over his entire body, doesn't like to play checkers with his son, and only spends time with him when they take their piles of trash bags to the dump every couple of weeks. Augusten's 16-year-old brother doesn't appear to be much help either. He is rarely seen by the family, dropped out of high school, and hates their parents. I'm done after a chapter or two. This book seems a little too safe and generically written. It was turned into a Golden Globe-nominated movie in 2006, so I may Netflix it, if for no other reason than the always-fantastic Alec Baldwin, who plays Augusten's father.